It's been said that for maximum attention, nothing beats a good mistake. It's not much of a stretch to apply this neat little aphorism to the crypto and blockchain space over the past year. Although 2017 is already being called 'the year of the ICO,' the first quarter of 2018 has already seen $6.3B raised through ICOs, which amounts to more capital than the entire preceding year. While there's nothing wrong with the ICO model of raising capital, (quite the contrary), one unfortunate side effect of the explosion in opportunity has been a flood of bad actors seeking to cash in on the growth. The bottom line now is that investing in ICOs has become a shaky-at-best method of generating returns in digital assets. Unless you're deeply involved in the blockchain ecosystem, it's just too difficult to do thorough due diligence right now. However, there is an interesting idea that leaders in the space are just beginning to talk about and explore. The concept is broadly being referred to as 'the tokenization of everything,' which essentially entails a creating a new form of ownership that would bring unprecedented liquidity to traditionally illiquid assets. Ok, so what does it mean to 'Tokenize'? And for that matter, what is a 'Token'? Good question! An easy way to think about a token is a digital, programmable form of ownership. The concept isn't that different from securitisation, which has existed for hundreds of years. Securitisation is the process of financiers slicing up and distributing fractional ownership of a larger asset. This is the process that allows public companies to sell stocks, which are just minute ownership stakes in an enterprise. Tokens operate in largely the same way as securities, the primary difference being rather than having middlemen create and broker their sale they are digitally constructed and stored on a blockchain. Tokens really represent, in the words of Anthony Pompliano, the intersection of digital assets and traditional financial offerings - just a new technology improving old concepts. So what are some of the advantages of the token model of ownership over traditional securities? Liquidity - The creation of tokens significantly reduces the friction to trade ownership stakes in illiquid assets. The highly programmable nature of tokens due to the smart contract code that they are written on diminishes the need for third party involvement, which usually extend the selling and purchasing process. By keeping track of ownership on a blockchain, an immutable ledger that tracks the sale of assets in real time, there is almost no limit to what can be tokenized and traded. Think traditional illiquid asset classes such as real estate or VC, or emerging asset classes that have been difficult to access such as diamonds or carbon-offset. Visibility - Tokens are an interesting answer to one of the most persistent problems with secondary markets, namely how difficult it is to track assets that move through them. Take the example of concert tickets, for which there is currently a very large and unregulated secondary market. Distributors like StubHub shoulder the burden of selling tickets from venues and artists by releasing them to the public via their platform. Savy concert-goers have taken to buying up tickets in bulk as soon as they are released, only to flip them for (sometimes enormous) profit. Tokenizing ticket sales would not only afford distributors and artists greater control of ticket prices (by programming, for instance, a maximum price increase of 10%) but it would allow valuable insight into customer behavior for distributors. For starters, an improved understanding of who the true end-users of the tickets are will allow distributors to target them more effectively. Accessibility - As a result of the way our current financial system is set up, many investment opportunities are not accessible to all participants in the global market. In the world of private investments this can be for any number of reasons: geography, logistics, knowledge, or (as is often the case) your level of participation in the financial system (aka, being 'in the know'). The ability to trade in illiquid assets to anyone with an internet connection increases the size of the investor base, and promotes healthy competition within the market. Efficiency - The real selling point for tokens is their ability to drastically reduce the involvement of middlemen in financial transactions. Smart contract code allows for the programming of highly specific ownership clauses in the tokens themselves. These clauses execute autonomously, eliminating the need in many cases for lawyers, bankers and brokers. In addition to the cost savings, the autonomous nature of token ownership facilitates faster deal execution, allows for automated service functions, and eliminates many complexities in the exchange of ownership. Doesn't this all sound a little too good to be true? There are $256 trillion dollars of real-world assets today. Most of these assets are owned on paper, facilitated by third party broker, and are highly illiquid. Blockchain technology has allowed for a new form of ownership that would reduce the transactional friction of these assets by several orders of magnitude. If even 1% of these assets were tokenized, that would represent a $2.56 trillion market (which should make you stop and think if you've been screaming that the crypto market cap of $338B is the biggest bubble in history). Before you get too excited and decide to fire your banker or lawyer though (we can all dream right?) it shouldn't be forgotten that middlemen exist for a reason. Financial institutions do serve some important functions. Traditionally, they are responsible for underwriting deals, preparing marketing materials, ensuring security and compliance, and driving execution. In a tokenized world, all of those responsibilities get shifted onto the buyer and seller. Most pressingly, tokens are notoriously difficult to custody in a safe and secure way. 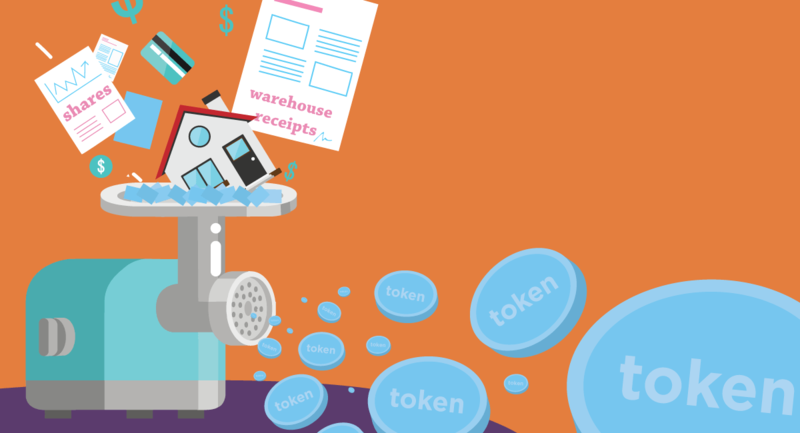 Tokens are a form of bearer asset, which means that anyone who knows your private key (think of it as a password to the account that holds your tokens) has access to all of your assets. If you lose your private key or someone uses it to empty your account, there is no 'bitcoin helpdesk' to support you - the assets are just gone. There are several companies such as Coinbase and Blockchain that are working on secure storage, but we are still not where we need to be in terms of an easy to use, trusted source for holding onto digital assets. Tokens do represent an exciting new opportunity, but in the case of any major paradigm shift, there will be some kinks to work out before we see mainstream adoption.